View of “NON Unplugged 2012,” 2012. The key is a symbol of trust as well as entry, and Sislej Xhafa’s first solo exhibition in Istanbul offers the possibility for viewers to own a new key—and perhaps a nocturnal adventure. 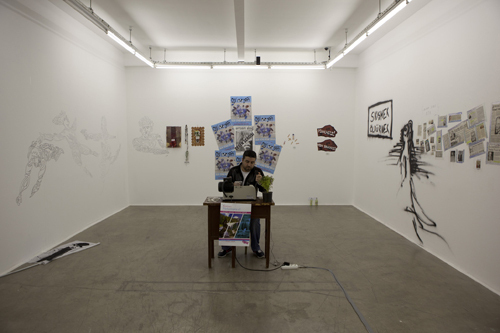 Xhafa’s installation contains only a chair, a table, and a key duplicating machine along with the man who runs it. The rest of the gallery is empty, and all security equipment has been removed. For a minimal sum of twenty Turkish liras, a key from the cutter’s growing pile can be purchased, and with it comes the opportunity to access gallery NON at any time, day or night. NON Unplugged 2012 is a re-siting of Xhafa’s 2006 exhibition at Frankfurt’s Galerie Michael Neff. While that show occurred in a ground-floor space with a window and entry to the street, in Istanbul Xhafa’s intervention is located on the fourth floor of a private building. Hence, the team at NON and those who choose to use the key are dealing with a much more complex chain of trust relationships where exploits remain hidden until the morning after. In the first few days after the opening, a tube of mascara, installations made with orange tape, and empty beer bottles were found in the space. Next, a form of institutionalization reared its head, replacing spontaneity with rumors of structured happenings on the way: a birthday party, an exhibition of cat paintings. Xhafa’s interventions often explore current cultural paradigms and economic fluctuations by encouraging audiences to express their own desires within his work. Today, a thriving economy and a strong art scene are raging in Istanbul. Xhafa’s work plugs into this local hedonistic vibe but also reaches out to a wider public, inviting them to do with the gallery as they please, in the entertainment hub of the city.